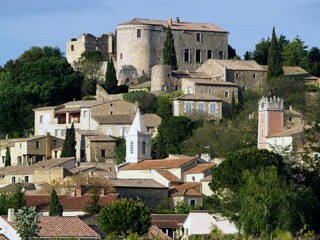 You are looking for an exceptional location to celebrate an important event, wedding, anniversary, seminar ..
Chateau of Vénéjan is located on a hillside overlooking the old village of Vénéjan, Gard, between Bagnols sur Cèze and Pont Saint Esprit. To organize the reception of your choice in this fully restored medieval site and inhabited by the owners (built in the early fourteenth century by Pierre de Béziers, under Philip the Fair), we suggest you invest a set of open places : only the exteriors can be rented. Full of grandeur and charm. May to September : Our reception facilities are only external. Contact us for a visit. 10-12 beds (or 4 bedrooms) on site.